Why Buy A Rave Water Trampoline? 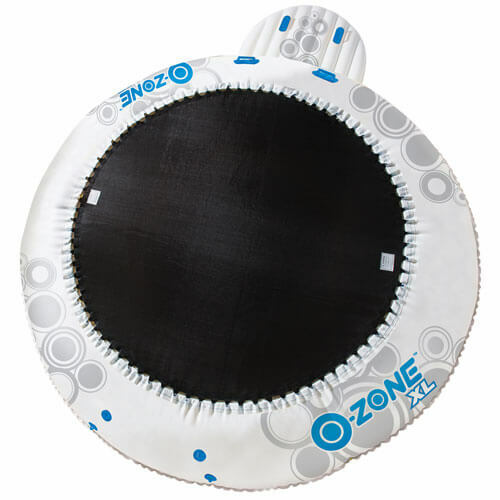 The Rave water trampoline offers the very best in quality and fun when it comes to water trampolines. Inflatable water trampolines are their specialty, offering the biggest, safest, most innovative products in the water sports industry. 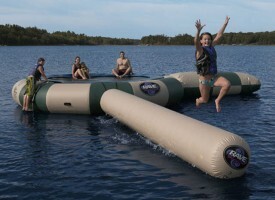 Rave Sports didn’t jump on the water trampoline bandwagon; they created it. They were the first to sell floating water trampoline. They did this in year 1998. Rave Sports water trampoline leads the worldwide water trampoline market in volume, safety, and innovation. When you buy a Rave water trampoline, you are buying the best quality. This was determined by independent testing. 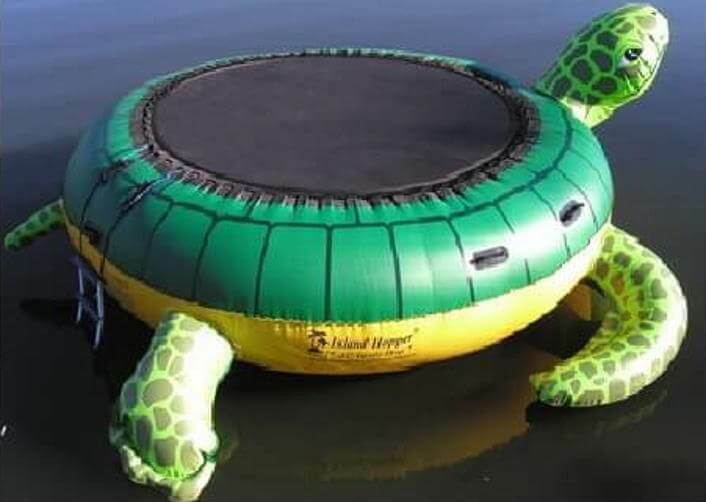 No water trampoline manufacturer represents better quality. Best quality means durability, longevity and safety. Rave Sports water trampoline products come with a lifetime warranty. The Benefits Of Having a Rave Sports Water Trampoline? 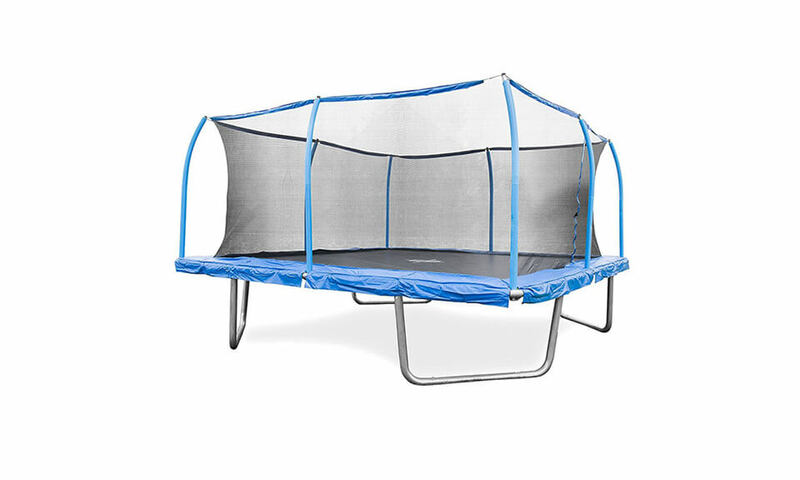 This fun filled floating trampoline is great for kids. It is a great way to encourage kids to be outdoors and away from television, video games and computer games. 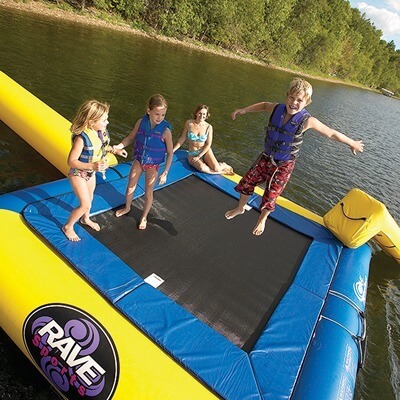 Children of all ages can make fun games out of having a Rave water trampoline, which will in return give the parents a little free time to relax. 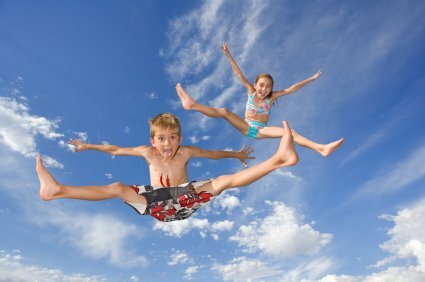 Like a back yard trampoline, it is great exercise for children. When they get too hot, they just jump into the water to cool off. It is safe and it keeps the kids closer to home and the family, as you will find that it will attract their friends. Adults love the Rave water trampoline as well. Apart from being so enjoyable and so much fun, jumping on a water trampoline is great exercise. 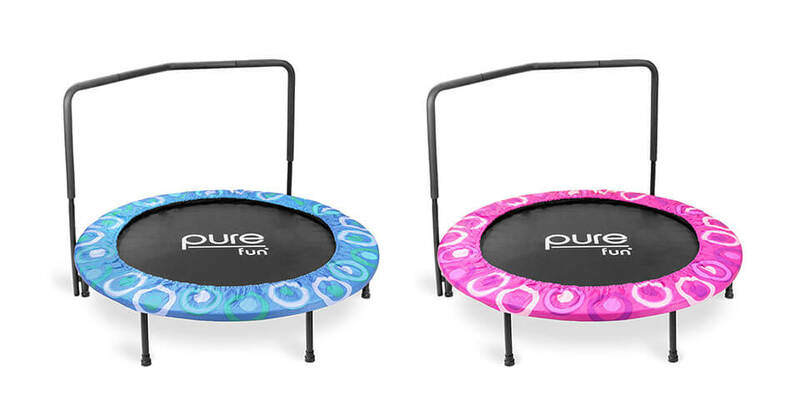 Trampoline exercise can be done at your own pace and can have the same benefits of aerobics, without the strain on your joints. 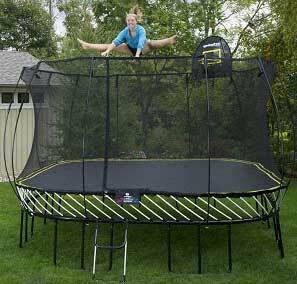 Just 10 minutes a day on a trampoline can help you ease stress, improve lung capacity and help you sleep better. Plus, as it is on the water, you can simply jump into the water to cool off after working up a sweat. 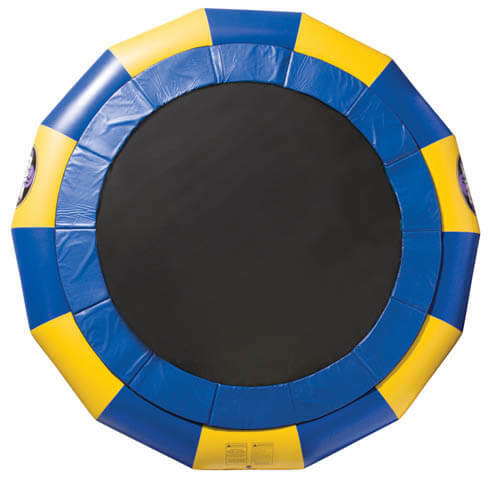 A downside for you is that if you do want to use your Rave water trampoline, you will have to fight the kids for it – as usually there is quite a bit of activity around these fun filled devices. A Rave Sports water trampoline is much safer than a back yard trampoline, for you and your children. 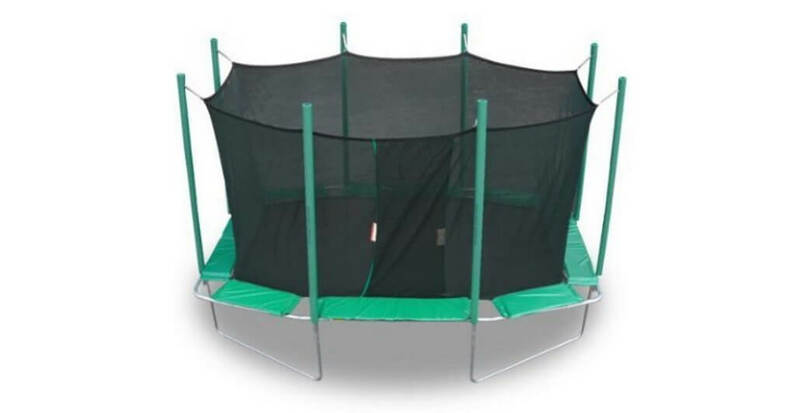 One of the big problems associated with back yard trampolines is the risk of falling or landing badly, causing sprains, bruises, and even broken bones. A floating, inflated trampoline offers no hard edges for users to land on, and if you fall off, you’ll just land in the water. 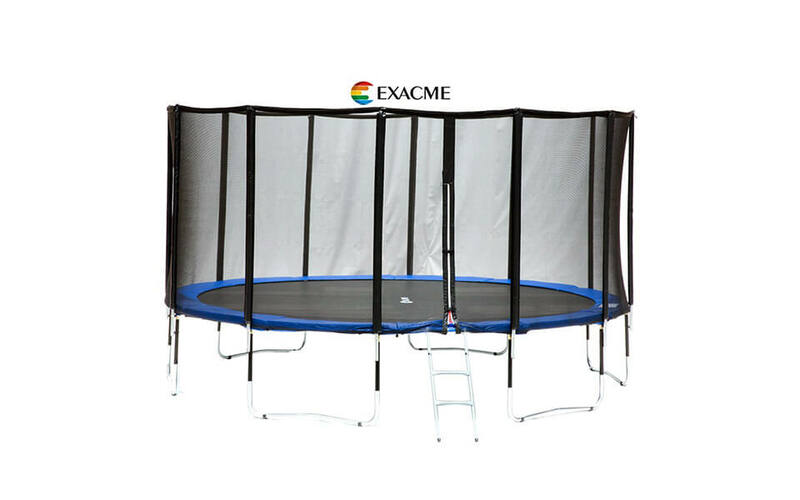 When you buy a Rave water trampoline product you can enjoy the peace of mind that comes from using a high quality, safe product. You know that you are buying the best from the market leader. 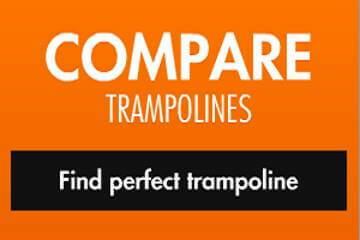 You can review the full range of Rave Sports water trampolines below or in our online store. The prices vary according to size of the water trampoline. What users have to say about the Rave Sports water trampoline? The unit is SOLID. It comes it two boxes that weight almost 200lbs each! You will not be moving this thing out of the water yourself! It has 4 nice handles on the sides for moving it, you will need them! The ladder is nice. The tramp section is solid, with serious springs. It comes with a serial number, and a detached serial. This is for theft protection, nice touch. It draws people together. This unit becomes a focal point for activity, and draws family and friends together. The kids and adults both enjoy this unit. We had a “seadoo splash island” first. It was rugged enough, but was a better platform for suntanning or wrestling. 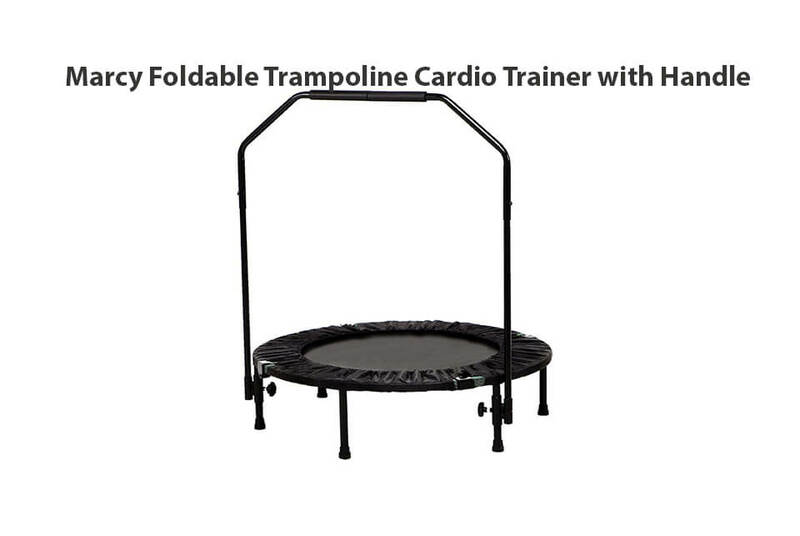 This Rave is an actual trampoline with springs, so it does get used for bouncing as well as all those other things. 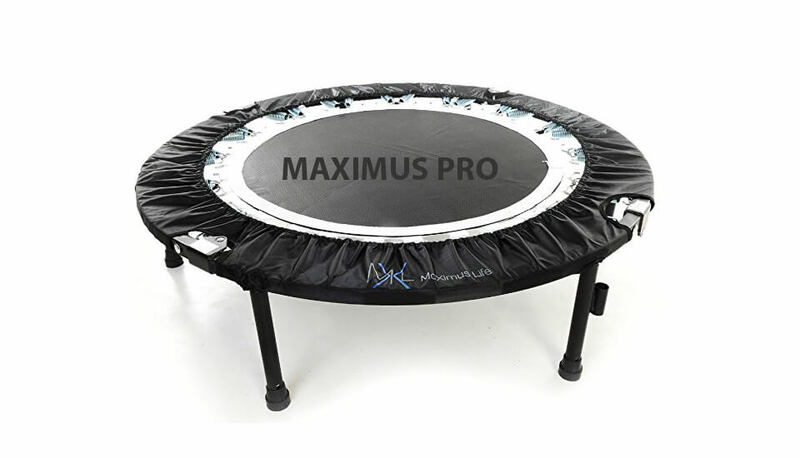 If you view youtube, it will seem like they are not getting a lot of air off the tramp. This is somewhat true. Some energy gets transferred into creating waves, etc, so no 15ft high bounces (this may be a safety feature, lol) BUT, everyone seems to love it anyway. This unit is an aquatic play center, not a replacement for a serious land trampoline, even though the hardware is 100% serious. I believe the larger units would give better bounce due to larger displacement. Even my 1.5 year old loves to go out and “bounce” on this with his lifejacket on! The usual retail price is the ONLY reason I did not give it 5 stars! Is it worth the cost? To some it will be worth every cent, others… of course not. It gets used a lot more, and seems to give more pleasure than any neighbours boat (that includes canoes or our kayaks)! It also uses a LOT less fuel than the motorboats! I got a good deal on it, and I am VERY happy with the unit.